Der langjährige US-Aktivist Jake Conroy ist diesen Sommer in Deutschland unterwegs. Wir organisieren eine Diskussionsveranstaltung mit ihm in Berlin (in englischer Sprache). How can we best achieve social change – by focussing on educational outreach and individual livestyle changes, or by putting pressure on corporations and industries? With a critical look at the contemporary animal rights movement, Jake Conroy argues that in order to slow down and eventually stop the ever-growing animal industry, we should not rely on individual action. Also, he thinks that it’s essential to learn from and work together with other social movements that are often struggling against the same exploitative and destructive industries. 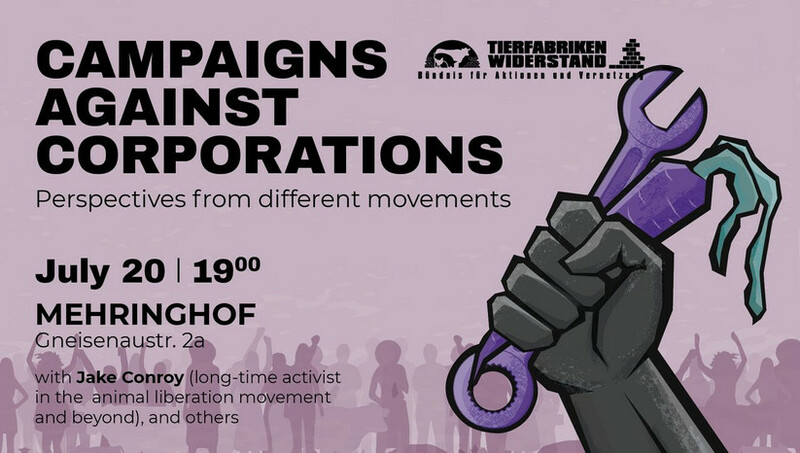 After a short presentation by Jake, two Berlin-based activists from different areas will comment on his arguments and share their own experiences and views on successful political strategies. Afterwards we will have an open discussion with the audience. Jake Conroy is a long-time activist, designer, and writer based in San Francisco, California. He was involved in Stop Huntingdon Animal Cruelty USA (SHAC USA), an international radical grassroots campaign to close a notorious animal testing laboratory. Due to his involvement with SHAC USA, he was a co-defendant in the SHAC7 case and was sentenced to 48 months in federal prison. Jake is currently working at an international environmental non-profit campaigning against corporate polluters. Ben is a software engineer from Berlin and member of the anarcho-syndicalist trade union FAU Berlin. Since 2015, he has been organizing the TVStud struggle for a new colllective agreement for the student research assistants at the Berlin universities in cooperation with many other groups and unions. We will add information about the third speaker here as soon as we have their attendance confirmed! Auf Grund des Organisationsaufwandes planen wir nicht mit einer professionellen Übersetzung – es könnte vor Ort zu einer „Flüsterübersetzung“ kommen, aber dafür können wir nicht garantieren.